Photo By: Kendall Bierer/Phelps Media Group. Tampa, FL – March 27, 2013 – The gates to the Bob Thomas Equestrian Center opened this morning to welcome in the top riders in the nation to the two-week Tampa Equestrian Series. Commencing with the Tampa Bay Classic, jumper riders gathered in the brisk morning to vie for the coveted championship honors. The competition was heated in the Covered Arena as competitors raced against the clock, attempting to prove themselves in the $5,000 1.40m Open Jumper class, but it was Michael Morrissey aboard Padie Blu Cardu who blazed the way, posting a target time that proved resilient. The course this afternoon was designed by Michel Vaillancourt of Canada, built to be both challenging and technical for horse and rider alike. It featured a liverpool, bending lines, a tight vertical-vertical-oxer triple combination, and a vertical-oxer double combination. During the 1.40m Jumpers only four riders posted clear rounds, demanding a grueling jump-off where time and accuracy worked hand-in-hand to make or break the teams’ efforts. The short course included a tight right rollback, a demanding bending line to the liverpool, and a daunting final oxer. Derek Petersen was the first rider to complete the course with ease, while keeping all rails intact aboard Cosino B, owned by Jenna Friedman. He moved into the jump-off, once again concluding with a clear round and posting one of only three double-clear efforts. His time of 34.460 seconds stayed solid until Michael Morrissey and Padie Blu Cardu, owned by Starbit Partners, LLC, rose to the challenge. Morrissey’s quick pace through the short course, as well as his tight turns, eventually earned them the blue ribbon ride. Morrissey covered the ground in 32.571 seconds, as the other riders attempted to catch the pace he had set. Sulu Rose-Reed and Envy were the next to tackle the track and make their way into the jump-off. Reed completed the short course in 35.835 seconds, falling more than three seconds behind Morrissey’s unmatchable pace. Aaron Vale tried to take over the lead aboard Spirit of Athena, owned by Campos & Miranda Investments; however, an unfortunate rail sealed their fate in the fourth place position. The 1.35m Open Jumpers was high with anticipation as riders took their turn on the track. Morrissey was the first to post a double-clear effort, avoiding time faults while keeping all rails in their cups. He guided RMW Malva LS La Silla, owned by Imperial Show Stables, to a speedy jump-off round, crossing the finish in 35.500 seconds. It seemed as though his time would stand the test, until Vale returned to the ring aboard Palm Sunday, owned by Amen Corner Farm, LLC. Vale blazed toward fence one with the first place finish clearly in his sights. He sliced the rollback from one to two with ease, and moved forward with a strong pace that could not be matched. Vale broke the beam in a mere 33.634 seconds. Morrissey’s time held strong enough for the second place award, while Beth Goodwin and Baldato rounded out the top three. Vale continued his winning ways earlier in the day during the 1.30m Open Jumpers. Vale surpassed 20 entrants to take the first place prize aboard Zadermus, owned by Dasilva Investments, posting a double-clear effort in 31.948 seconds. Only David Jennings and East Bound Down, owned by Hays Investment Corporation, came close to Vale’s efforts, but being 3/100ths of a second behind the dominating pair proved only good enough for second place. Christopher di Carlo and No Autographs Please, owned by Dakota Schramer, claimed the third place ribbon with their jump-off time of 32.273 seconds. “The Tampa Bay Equestrian Series is close to us, and after a long winter circuit showing in the same venue for nine weeks, it’s a refreshing change of pace for us. It’s a fun town. You get to come eat at some different restaurants for a couple of weeks, change the venue a bit, get some fresh air. We just enjoy it here,” Vale concluded. The first week of the Tampa Bay Classic holds numerous highlights for the jumpers. Tomorrow will begin with the 1.40m Open Jumpers division where top riders will continue in the hopes of earning the blue ribbon prize and championship honors. Also included this week is the $32,000 Tampa Bay Welcome Stake on Friday, March 29, and the Show Jumping Hall of Fame Junior/Amateur-Owner Jumper classes where competitors will contend for the East Coast Championship points. For more information about the 2012 Tampa Equestrian Series, please visit www.StadiumJumping.com. Michael Morrissey and Vorst won the $50,000 Rood & Riddle Grand Prix at the Kentucky Summer Classic. Photo By: Kenneth Kraus/ PhelpsSports.com. Lexington, KY – August 6, 2011 – There was a huge crowd gathered at the Rolex Stadium tonight to witness the $50,000 Rood and Riddle Grand Prix during the Kentucky Summer Classic. The event was held in conjunction with the Kentucky Horse Park’s “Hats Off Day,” and the audience had the opportunity to witness a very exciting grand prix event. Michael Morrissey and Vorst topped the eight-horse jump-off with a very fast double clear effort, and Morrissey took home the winning prize for the second year in a row. The duo surpassed Ashlee Bond and Chivas Z who took home second, while Rebecca Conway showed Twister to the third place honors as the only other fault free horses over the short course. Leopoldo Palacios of Venezuela designed a demanding first round track for tonight’s 20 competitors, which featured a liverpool, an open water with a pole, a vertical-oxer double combination, and a large triple bar-vertical-vertical triple combination. Eight horse and rider combinations were able to advance to the tiebreaker for a shot at the winning title. The jump-off began with a single vertical followed by a wide oxer to the vertical-vertical portion of the triple combination. Riders then made a left turn to an oxer-oxer line before galloping across the ring and past the gate to the final vertical. Ashlee Bond was the first to make an attempt over the shortened course and she set the time to beat aboard Chivas Z, owned by Little Valley Farms of Hidden Hills, CA. The duo was very speedy to each obstacle and took a sharp route to the final vertical, cutting through the double combination. Their efforts paid off with a fault free score in 37.583 second, which would eventually net them the second place honors. 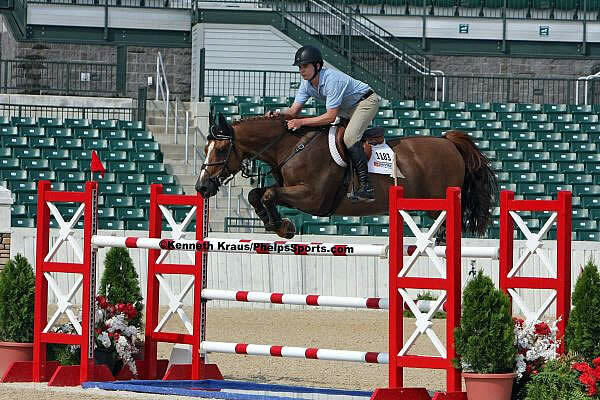 Angel Karolyi and Galant won the 1.40m Open Jumpers at the Kentucky Summer Classic. Photo By: Kenneth Kraus/ PhelpsSports.com. Lexington, KY – August 3, 2011 – Early thunderstorms could not stop the exciting jumper action in the Rolex Stadium for the opening day of the Kentucky Summer Classic at the Kentucky Horse Park. This afternoon, riders had the opportunity to compete in the 1.40m Open Jumper speed class and the 1.35m Open Jumpers. Angel Karolyi led the way in the 1.40m Open Jumpers aboard long-time partner Galant, while Michael Morrissey sped to victory in the 1.35m Open Jumpers, completing the fastest double clear effort with Vorst. Leopoldo Palacios of Venezuela designed today’s technical tracks in the Rolex Stadium. For the 1.40m speed class, riders had to show over a wall fence, a liverpool, an oxer-vertical double combination, and a vertical-oxer double combination. Only six horse and rider combinations were able to be speedy and tidy, leaving all the rails intact and tripping the timers without fault. Christian Heineking was the first on course during today’s 1.40m Open Jumper speed class, and he set the pace with a clean effort in 77.187 seconds aboard NKH Barbosa, who would eventually place fifth. Michael Tokaruk quickly upped the ante with a fault-free round in 74.409 seconds riding Gama Righter Z, and eventually taking home the fourth place award. Angel Karolyi and Galant, owned by McLain Ward of Brewster, NY, were only the third horse and rider combination to enter the ring during today’s 18-horse competition, but they easily jumped to the top of the leaderboard. The talented rider guided his nimble mount over each obstacle, and with each rail intact they crossed the finish line in 70.183 seconds to eventually earn the winning title. 9 July 2010 – Michael Morrissey (USA) has been suspended for three months and issued a yellow card with retroactive disqualification for excessive use of the whip in class 101 at the Wellington CSI 2* held on 27 February 2010. Mr Morrissey has also been subjected to a fine of CHF 2,000. The suspension from FEI competition will run from 5 May to 4 August, concurrent with the three-month suspension imposed on Mr Morrissey by the United States Equestrian Federation (USEF). An investigation into the role of the Ground Jury in this incident showed that Mr Morrissey should have been disqualified at the time. Letters of reprimand have been sent to all members of the Ground Jury. The full text of the decision is available here: MORRISSEY.